There's physical medicine for your body, psychotherapy for your mind - but what about the health of your life force itself? While most doctors and scientists in the West have just begun to realise the immense healing power of the body's energy systems, Judith Orlff, M.D., has blazed a trail in this emerging field with her internationally renowned Positive Energy Program. 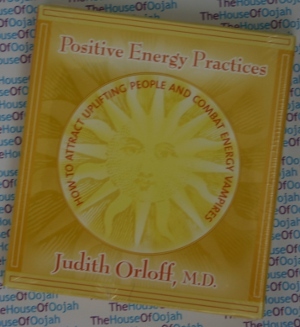 Now, with Positive Energy Practices, based on her best seller Positive Energy, this pioneering professor of psychiatry provides you with her practical tools and techniques to harness the power of revitalizing energy and combat the influence that deplete you. Transforming the face of psychiatry, Judith Orloff, MD is an assistant clinical professor of Psychiatry at UCLA and author of the upcoming book Emotional Freedom. She synthesizes the pearls of traditional medicine with cutting edge knowledge of intuition, energy, and spirituality to achieve physical and emotional healing. She passionately asserts that we have the power to transform negative emotions and achieve inner peace. She offers practical strategies to overcome frustration, stress, and worry and teaches people how to quiet overactive minds that won’t shut off. Dr. Orloff, who comes from a family of 25 physicians, advocates "a democracy of healing," wherein every aspect of ourselves is granted a vote in the search for total health. She has been celebrated for her unique approach to mental well-being by proving that the links between physical, emotional, and spiritual health can’t be ignored. Dr. Orloff is accomplishing for psychiatry what physicians like Dean Ornish and Mehmet Oz have done for mainstream medicine. Dr. Orloff has spoken at medical schools, hospitals, universities, the American Psychiatric Association, Fortune Magazine’s Most Powerful Women Summit, and alternative and traditional health forums—venues where she presents tools to doctors, patients, and everyday people. She graduated USC School of Medicine, completed a four year psychiatric residency program at UCLA, and currently mentors UCLA medical students and psychiatry-residents-in-training. As a board-certified psychiatrist, Dr. Orloff blends her traditional medical skills with intuition to enhance patient care. Her new book Emotional Freedom helps readers liberate themselves from negative emotions and develop hope, compassion, and courage. It is a roadmap for those who are stressed, discouraged, or overwhelmed--and for those who are in a good emotional place but want to feel better. As Dr. Orloff shows, each day presents opportunities for us to be heroes in our own lives: to turn away from negativity, react constructively, and seize command of any situation. Her previous bestsellers include Positive Energy, Guide to Intuitive Healing, and Second Sight, a trilogy of books exploring new breakthroughs in intuition, energy, and how to combat an epidemic of exhaustion overtaking our world. Positive Energy is a national and Los Angeles Times bestseller which has been translated into 24 languages.